Beautiful pendant lamp with a round shade. This round shade is made from woven paper in the form of a rope which provides an ‘airy’ look. Very attractive when the light is turned on creating a very atmospheric and shadow like effect. Beautiful pendant lamp with a cube/hive shade. This cube/hive shade is made from woven paper and wired rope which provides an ‘airy’ look. Very attractive when the light is turned on creating a very atmospheric and shadow like effect. Beautiful pendant lamp with three shades. Each shade is made from woven paper and wired rope which provides an ‘airy’ look. Very attractive when the light is turned on creating a very atmospheric and shadow like effect. Beautiful pendant lamp made from woven paper and wired rope. Very attractive when the light is turned on creating a very atmospheric and shadow like effect. Beautiful pendant lamp made from woven paper and wired rope. 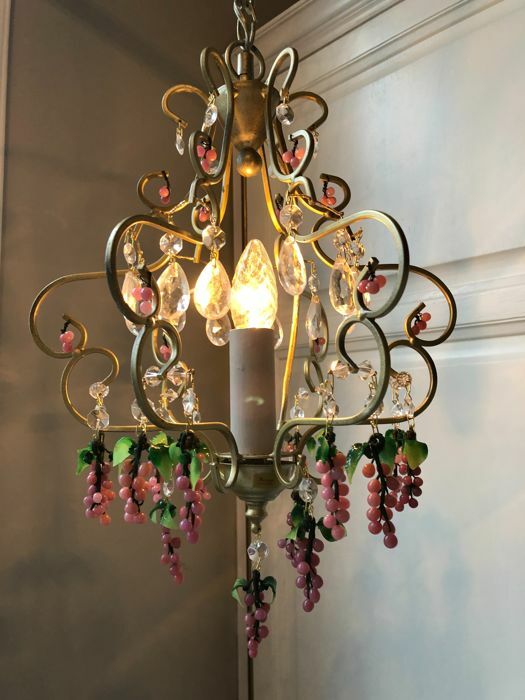 Modern version of the classic crystal ÂBagÂ chandelier. Very attractive when the light is turned on creating a very atmospheric and shadow like effect. Een wit metalen klemspot, zowel in een modern als in een retro interieur toe te passen. De klemspot is zowel draaibaar als kantelbaar, zo kunt u dus precies bepalen waar het licht naar toe schijnt! Een wit metalen spot, zowel in een modern als in een retro interieur toe te passen. De spot is zowel draaibaar als kantelbaar, zo kunt u dus precies bepalen waar het licht naar toe schijnt. Beautiful white metal spot lights which provides a stylish and contemporary design . You can rotate and tilt the shades so you can point it to the space in which you would like the light to be distributed. Una lampada da banco industriale progettata a Utrecht, grossolanamente ridipinta. Il marchio SIS è chiaramente visibile. Allungabile fino a 80 cm. Modern and sleek bathroom wall lamp beautifully designed in chrome with white glass shades. The Campino is a simple up and down lamp that is compact in size and height, making it the perfect bathroom wall lamp. The Campino comes with bulbs, 2 x E14 6W LED with a light output of 940 lumens. Questo PIZARRO si inserisce perfettamente in un interno moderno! Ã molto lungo e puÃ² quindi stare molto bello sopra il tavolo da pranzo o nel soggiorno. Ã lungo 116,5 cm e ha un’altezza di 5 cm. La lampada include 4 sorgenti luminose LED (non sostituibili). grazie all’etichetta energetica A e al LED, questa lampada Ã¨ estremamente efficiente dal punto di vista energetico. La lampada Ã¨ anche dimmerabile, per quando preferisci avere una luce accogliente nella stanza di sera. Il dimmer Ã¨ incluso anche in questo spot! Sturdy and modern ceiling lamp with 5 adjustable spots finished in steel. The Duellant is sleek and stylish, designed with perfection this ceiling lamp is a true statement maker that will emit beautiful and atmospheric lighting. Adjustable spotlights are perfect and practical allowing you to direct light where it suits you best, this ceiling lamp will add boldness and vibrancy to your living room, kitchen or hallway! The perfect space saver in any area you choose to use it in. The Duellant comes complete with 5 x built-in non replaceable long lasting LED light sources, 21.5W with a light output of 2000 lumens. Il Danillo Ã¨ un vero must per il bagno! La combinazione del bianco con l’acciaio inossidabile lo rende davvero moderno. Ã perfettamente progettato per schizzi di acqua e polvere, a causa del valore IP di 44. La lampada Ã¨ alta 16 cm e ha una profonditÃ di 7,5 cm. Modern and decorative round ceiling lamp with 5 arms in chrome. The Portos comes complete with a remote control allowing you to control the lamp from the comfort of your chair, choose to go from warm white to cool white ranging from 3000K to 6000K, dim the lamp using the brightness button on the remote control and the overall switch of on and off. This ceiling lamp is perfect as part of your modern decor, ideal for living room, kitchen, bedroom or dining area. The Portos comes complete with built-in non replaceable long lasting LED light source, a total of 25W with a powerful light output of 2000 lumens. De Silas is een echte eyecatcher in huis! Deze tafellamp past perfect in een modern interieur. Hij is 50 cm hoog en 8 cm breed. De voet heeft een lengte van 14 cm en een breedte van 11,5 cm. Door het energielabel A en het gebruik van de LED is hij enorm energiebesparend. Wanneer je verkiest om in de avond gezelliger licht te hebben in de woonkamer, is deze lamp perfect. De lamp is dimbaar via een 3 staps dimmer (dimmer niet inbegrepen). De 3 staps dimmer werkt met een touch systeem. Op stand 1 schijnt de lamp voor 100%, op stand 2 voor 60% en stand 3 is enorm gezellig licht: dan schijnt de lamp nog maar voor 30%. Door de zilvere kleur krijgt de lamp een heel moderne uitstraling! De vorm maakt hem nog specialer. Het artikel wordt met snoer en stekker geleverd (kabel is 180 cm lang). Breng een moderne touch in huis met deze Silas! Modern and stylish outdoor wall lamp finished in grey. The Rico is beautifully designed to light up your chosen area to provide an atmospheric and decorative lighting to stream through. This wall lamp is 27cm in height and 6.7cm wide making it compact in size and shape, perfect wall lamp to fit in with your outdoor decor, ideal for your porch or garden. The Rico comes complete with a motion sensor that will provide a sense of security and lighting whenever you need it as it responds to movement. It also comes complete with an energy efficient non replaceable built-in LED light of 5.5W and a light output of 550 lumens. Let’s go vintage! Deze wandlamp is perfect om je muur een vintage look te geven. De charmante wandlamp is zo gemaakt om u te voorzien van de perfecte verlichtingscombinatie door de ingebouwde leeslamp, die je zelf kan verstellen naar jouw zin. Met de schakelaars kunt u de sfeerlamp in de kap en de functionele LED leeslamp afzonderlijk van elkaar bedienen. De combinatie van de stoere look van het staal en het mooie bloemendesign maakt deze lamp zo uniek. Naast design aan de buitenkant is de lampenkap met goud afgewerkt aan de binnenkant. Door de velours afwerking geeft het je kamer een zachte look. Een echte must-have dus! Modern and stylish outdoor wall lamp finished in grey. The Rico is beautifully designed to light up your chosen area to provide an atmospheric and decorative lighting to stream through. This wall lamp is 27cm in height and 6.7cm wide making it compact in size and shape, perfect wall lamp to fit in with your outdoor decor, ideal for your porch or garden. The Rico comes complete with an energy efficient non replaceable built-in LED light of 5.5W and a light output of 550 lumens. Let’s go classy! Deze wandlamp is perfect om je muur een klassieke look te geven. Door het gebruik van staal krijgt de lamp een stoere look. De charmante wandlamp is zo gemaakt om je te voorzien van de perfecte verlichtingscombinatie door de ingebouwde leeslamp. Met de schakelaars kan je de sfeerlamp in de kap en de functionele LED leeslamp afzonderlijk van elkaar bedienen. De witte lampenkap is een echte eyecatcher, zeker in combinatie met het staal. De kap wordt net iets specialer gemaakt door de zwarte rand. Een echte must-have dus! Un pezzo davvero vintage che devi avere! Ti piacciono gli oggetti classici a casa? Allora dovresti sicuramente segnare questa lampada. La Maira Ã¨ alta 155 cm e ha un diametro di 35 cm. Il cappuccio Ã¨ alto 33 cm e ha un diametro di 35 cm. Con una fonte di luce di massimo 60 watt (presa E27 di grandi dimensioni), finisci completamente! Questa lampada si adatta molto bene sopra il tavolo da pranzo. Se appendi due insieme, crei una luce piÃ¹ bella nella stanza! Let’s go modern! Deze wandlamp is perfect om je muur een moderne look te geven. Het is een praktische en stijlvolle wandlamp uitgevoerd in een fraaie messing kleur. De charmante wandlamp is zo gemaakt om je te voorzien van de perfecte verlichtingscombinatie door de ingebouwde leeslamp, die je zelf kan verstellen naar jouw zin. De lampenkap met pauwenprint in combinatie met goude binnenkant is een echte eyecatcher die niet kan misstaan! Een echte must-have dus. Beautiful and vintage inspired table lamp in aged bronze. The Frieda is a true statement maker that fits perfectly with a romantic and vintage inspired decor, beautifully designed with great attention to detail. The ideal table lamp to emit a romantic, warm and atmospheric light in your living room, bedroom, dining room or office. The Frieda does not come with a light bulb, it takes 1 x E14 and suitable for both LED and halogen. Modern and stylish table lamp with steel base and clear glass shade. The Milton is so simple and compact in size and subtle in design this is the perfect additional accessory to your living room, office or childrenÂ´s room. Complement the table lamp with a statement making candle filament bulb to create a warm and atmospheric lighting, the Milton does not come with a light bulb, it takes 1 x E14 and suitable for both LED and halogen. Vintage, sleek and simple floor lamp finished in antique grey without shade. The Simplo, just like its name is simply designed in a smooth and streamlined finish, the ideal floor lamp to add to your vintage decor that will create a beautiful, warm and atmospheric lighting with a decorative purpose, perfect for your living room, bedroom or office. The Simplo does not come with a bulb, it takes 1 x E27 and suitable for both LED and halogen, with a total height of 145cm and a base diameter of 24cm with a cable length of 250cm. Simple and art deco pendant lamp three in brass with three different coloured glass shades. The Pallon 3 comes with ice blue, green and ocean blue glass shades and beautifully designed, charming and decorative making it a true statement maker in any space. The ideal pendant lamp to add to an art deco or modern inspired decor that will create a beautiful, warm and atmospheric lighting with a decorative purpose, perfect for your living room, dining room or kitchen. The Pallon does not come with bulbs, it takes 3 x E27 and suitable for both LED and halogen. Part of the Pallon series. Quando sei completamente innamorato dello stile moderno, questa lampada da esterno Missouri Ã¨ per te. Ã molto stretto a causa della forma ovale e il colore grigio lo rende completo. Il Missouri Ã¨ lungo 26 cm e ha una larghezza di 11,5 cm. A causa del valore IP di 54, puÃ² sopportare la pioggia e la polvere. Una vera lampada da esterno! Grazie all’illuminazione a LED e all’etichetta energetica A , questa lampada Ã¨ davvero a risparmio energetico. PuÃ² durare per 20.000 ore. CiÃ² che rende la lampada ancora piÃ¹ speciale Ã¨ che la cover Ã¨ inclinabile. CosÃ¬ si puÃ² scegliere un sacco di luce al di fuori quando si sta lavorando ad esempio, o accogliente oscurato luce come ci si siede all’aperto sulla terrazza. Quello Ã¨ due in uno! Beautiful and country inspired ceiling lamp with 5 armed decorative glass shades. The Caprice is stylish and charming, with its rust brown finish and ornate design making the perfect true statement maker for your chosen space! The decorative glass shades will emit a romantic, character and atmospheric lighting in your living room, kitchen or bedroom! The Caprice does not come with a light bulb, it takes 5 x G9 and it is suitable for both LED and standard halogen bulb. Modern and sleek bathroom wall lamp beautifully designed in steel with opal glass shades. The Eurico is a simple up and down lamp that is compact in size and height, making it the perfect bathroom wall lamp. The Eurico does not come with bulbs, it takes 2 x E14 and suitable for both LED and halogen. Lampada LeitzUna lampada Leitz unica. Dispositivo Leitz finemente rifinito con una lampada con sopra un filtro (blu). Fa per l’illuminazione dell’atmosfera. Condizioni ben funzionanti, lievi segni di usura.La lampada è di ca. 15,5 cm di altezza, il diametro è di ca. 14,5 cm. Piccolo portalampada.Verrà spedito registrato con un codice di tracciamento. Bella lampadina a LED nello stile di una lampada ad incandescenza tradizionale. Godetevi dei benefici della tecnologia a LED! Bella forma e filamento visibile a forma spirale. Appositamente progettata per dare lÂatmosfera giusta, oltre a migliaia di ore di durata ed unÂalta efficienza energetica. Questa lampada da parete per esterno Ã¨ molto funzionale e ha un eccellente disegno e un sensore di movimento. La luce di questa lampada illumina verso l’alto e verso il basso. Questo dÃ un effetto meraviglioso sulla parete. Con un livello di protezione IP44 questa lampada puÃ² sopportare forti rigori. Ã facile da collegare e funziona a 230V. Non sarÃ piÃ¹ necessario cercare al buio le chiavi di casa, DUO risponderÃ ai movimenti accendendo la luce. Realizzata in acciaio inossidabile di alta qualitÃ, questo moderna ed elegante lampada da parete DUO certamente sarÃ un successo per la vostra facciata. Questa lampada da parete SOLO ha un design semplice e moderno. Il faretto fornisce abbondanza di luce ambientale. La lampada Ã¨ fatta di acciaio inossidabile e ha un livello di protezione IP44. Di conseguenza, questa piccola applique puÃ² essere facilmente appesa all’aperto. La lampada Ã¨ facile da collegare e funziona a 230V. Non sarÃ piÃ¹ necessario cercare al buio le chiavi di casa, SOLO risponderÃ ai movimenti accendendo la luce. Bella, moderna e con un design elegante. State cercando una lampadina per le vostre lampade? Questa lampadina GU10 7,5W 3000K Ã¨ sicuramente adatta per voi! Con questa lampadina GU10 dÃ una luce bianca calda che massimizza lo spazio nel salotto o la camera da letto. Lasciate che la vostra stanza sia piÃ¹ accogliente con una lampada a sospensione o una lampada da tavolo fornita con questa lampadina. Siete alla ricerca di una lampadina a LED per sostituire le vecchie alogene? Non cercate oltre! Questa lampadina COB GU10 5W fornisce una luce bianca calda ideale per il salotto o la camera da letto. Questa lampada da parete SOLO ha un design semplice e moderno. Il faretto fornisce abbondanza di luce ambientale. La lampada Ã¨ fatta di acciaio inossidabile e ha un livello di protezione IP44. Di conseguenza, questa piccola applique puÃ² essere facilmente messa all’aperto. La lampada Ã¨ alta 45cm ,facile da collegare e funziona a 230V. La lampada Ã¨ facilmente regolabile tramite lo snodo sferico. Quindi si puÃ² dirigire la luce verso dove vogliamo. Bella, moderna e con un design elegante. The rail track with 5 spotlights in white is ideal in areas where space is limited or in need of direct lighting. Move and adjust the spotlights efficiently on the rail to direct light on a chosen area or object. The ideal track lighting for showrooms or galleries allowing you to adjust lighting more conveniently and direct light where it suits you best. Easy to assemble and flexible to your needs. Simple and classical pendant lamp in steel that comes with 2 arms. Adjustable arms to allow you to direct light and extend it where you need it. Comes without a shade, choose a shade that suits you best from our range of hanging shades. Complete the look with E27 bulbs, choose from various decorative light sources.